(a) Surcharge: The amount of income-tax shall be increased by a surcharge at the rate of 10% of such tax, where total income exceeds one crore rupees. However, the surcharge shall be subject to marginal relief (where income exceeds one crore rupees, the total amount payable as income-tax and surcharge shall not exceed total amount payable as income-tax on total income of one crore rupees by more than the amount of income that exceeds one crore rupees). (b) Education Cess: The amount of income-tax and the applicable surcharge, shall be further increased by education cess calculated at the rate of two per cent of such income-tax and surcharge. (c) Secondary and Higher Education Cess: The amount of income-tax and the applicable surcharge, shall be further increased by secondary and higher education cess calculated at the rate of one per cent of such income-tax and surcharge. (d) Rebateunder Section 87A:The rebate is available to a resident individual if his total income does not exceed Rs. 5,00,000. The amount of rebate shall be 100% of income-tax or Rs. 2,000, whichever is less. 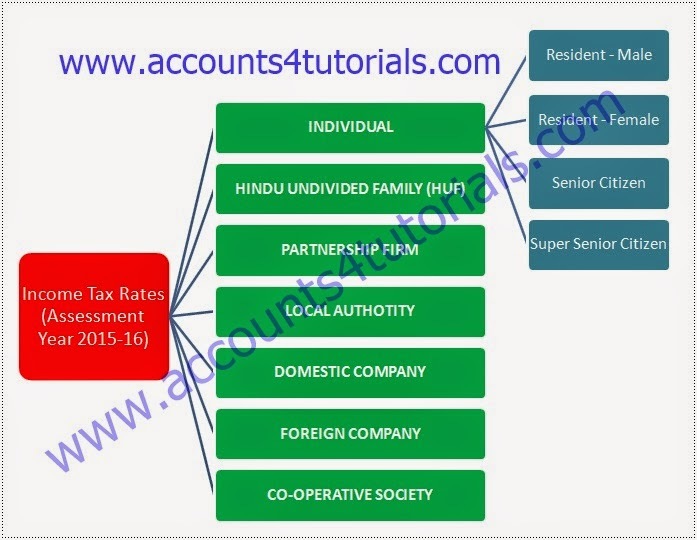 For the Assessment Year 2014-15 and 2015-16, a partnership firm (including LLP) is taxable at 30%. For the Assessment Year 2014-15 and 2015-16, a local authority is taxable at 30%. For the Assessment Year 2014-15 and 2015-16, a domestic company is taxable at 30%.